The present concept implements controlling of pump which pumps water from the sump (underground tank) to the overhead tank, using 8951 microcontroller. The control panel, i.e. the main control unit of the system which consists of the primary control switches, pump indicator, siren and level indicators. The visual example of how switches And the indicators can be placed as shown the figure below. 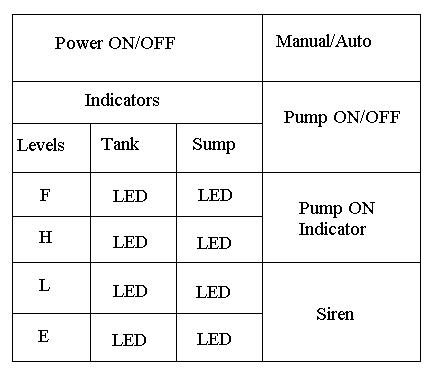 In the figure shown above there are total of nine LEDs, four of which indicates the water level in the tank, another four indicates the water level in the sump and one LED indicates whether the pump is ON/OFF. It also consists of three switches. Switch 1 is the main power switch which is used to activate the system. Switch 2 is used to select whether to operate the pump in AUTO or MANUAL mode. Switch 3 comes to picture only when the system is operated in MANUAL mode. It controls the direct activation of the pump. 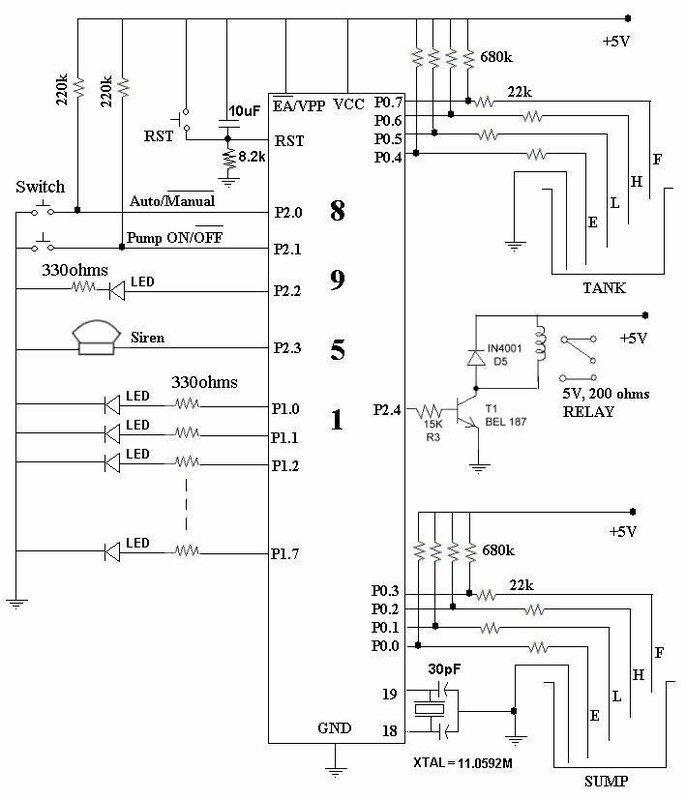 This system is built around an 8951 microcontroller and the circuit diagram is as given below. As you can see in the above diagram, port 0 is exclusively used as an input port which takes the information regarding the water level in the sump as well as in the overhead tank. Port 1 is used as output port which is connected to the indicator that indicates the water level in both the tanks. Port 2 is used as in/out port, it takes the input from switch 2 and switch 3 and gives the output which is connected to pump indicator, siren and the relay which controls the switching of the pump. When the system is active and in manual mode, it only indicates the water levels in the tanks and it doesn’t control any working of the pump. To activate the pump in manual mode switch 3 is used. In this mode the operator should manually control the working of the pump. As in case if the tank is full, operator should switch of the pump which is not the case when compared to auto mode. When the system is active and in auto mode, it only indicates the water levels in the tanks and it controls the working of the pump.